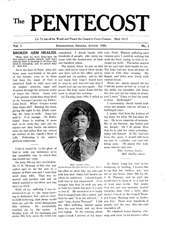 The Pentecost began publication in August 1908 as a joint publication of two Indianapolis Pentecostal missions: Apostolic Faith Mission and Good News Mission. J. Roswell Flower, C. J. Quinn, and R. S. McBride were the founding editors. In December 1908, Flower was listed as editor, and Kansas City pastor A. S. Copley became associate editor. Flower soon joined Copley in ministry at his church, and the periodical moved its place of publication from Indianapolis to Kansas City in April 1909. In January 1910, Copley took over the editorship and in 1911 renamed it Grace and Glory. Flower went on to become the first general secretary for the Assemblies of God USA. Under Copley, Grace and Glory became a leading early proponent of eternal security teaching within Pentecostal circles. Some issues of The Pentecost have not yet been located. If you possess issues that are not on this website, please contact the Flower Pentecostal Heritage Center at archives@ag.org.